It's good to be back, friends, and here at long last is the first installment of Volume Two: The Blood-Dimmed Tide. This volume covers 1915 and 1916 and is, like the first volume, twenty chapters long, with each chapter broken into several installments. Now that things are rolling, I hope to have the next installment up within a week or two. Village of Chateau Ducloux, France. February 16th, 1915 Through some administrative oversight no one was on the platform to meet the new German commandant as he stepped off the 9:18 train from Sedan, the ample stomach under his military overcoat giving him the look of a field gray ninepin. There was something ridiculous, something trivial, about this event in comparison to what had come before: the men called up into the army, the refugees streaming south, the Germans who had occupied the town and set up their headquarters in the town hall. There was no hint that his tenure would end under a cloud of accusations that his corruption and incompetence had led to the unnecessary execution of two of the town’s prominent citizens -- accusations of sufficient truth and gravity that the occupation authorities were forced to make a rare concession to public opinion and move him to another assignment. A freezing drizzle was falling. 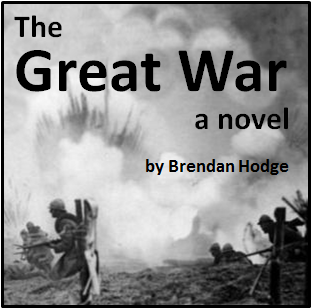 The new commandant’s orderly shouted and gestured at the station master while Major Spellmeyer himself stood with his umbrella, sheltering his luggage from the rain. It was new luggage, covered in tan leather and fastened with polished brass buckles. He had purchased them to celebrate his promotion to the temporary reserve officer rank of Major. The suitcases were of the same design and finish as the ones that he had seen the bank’s vice president use when he had arrived from Königsberg to visit their branch. And here, through the slackness of this first assignment, their pristine finish was being spotted with rain. He would bring some order to this posting, that he resolved. When at last the station master secured some transportation for them it was not a car or a taxi, such as the Major had expected, but an open farm cart. By the time they reached the town hall Spellmeyer was furious, and his new luggage was mottled all over from the rain. He tried to make this displeasure clear to Major Dressler as the two men met to hand over the command of the town, but the regular army officer who had been the town’s commandant since August and who far surpassed Spellmeyer in both experience and seniority, being a professional officer with the permanent rank of major (even if an old one recalled from retirement) raised a hand to silence the new officer. For a moment the silence drew out between them, and Spellmeyer had time to reflect on how imprudent it would be to offend this man who was doubtless destined for promotion and a frontline command. Major Spellmeyer gave a nod combined with a slight bow and tucked away the lesson for future use: An officer does not apologize to his inferiors. He must remember that. At the bank even the branch manager had not been so secure. The eddies of politics within the bank hierarchy were unpredictable. The man who was under you today might be promoted to some higher place tomorrow. In Dressler’s calm reserve Spellmeyer saw something nearly regal. He must learn to cultivate this himself. He was in command of a bataillon now -- a depleted, picked over, reserve bataillon with well under a thousand men, but a bataillon nonetheless, and the responsibility for governing a town and its environs. There was far more scope here than deciding which merchant’s line of credit should be extended and which should be forced to pay up or provide more collateral. Major Dressler was talking, offering those thoughts he had not deemed it appropriate to put in writing: about who among the French administration could be trusted, about the tactics for successfully conducting requisitions, about the necessity of maintaining some degree of goodwill among the population to ease the difficulties of governing. Spellmeyer nodded gravely and let the words flow over him. No, this would be nothing like business. This would be his kingdom. Nine days later, by contrast, a small crowd was on the platform when the 9:18 from Sedan arrived at the station with a squeal of brakes and a long sigh of released steam. Philomene Fournier, along with Madame Serre, stood just behind Pere Lebas, representatives of the parish. Madame Perreau, who in peaceful times would have stood with them, now took a more prominent place at the front of the crowd next to her son Justin, who had been appointed mayor by the Germans since the elected mayor, Monsieur Binet, had taken the town archives (and his young secretary) to the safety of Reims as the Germans approached. Philomene shifted from foot to foot, trying to bring some feeling back without losing her balance on the ice-slick paving stones. The weather had turned bitterly cold, but after long hesitation she had left at home her fur-lined coat. There were too many stories of luxuries being requisitioned on sight. The thought of a German officer taking away the coat which Henri had settled on her shoulders with a kiss and a “Merry Christmas, Ma Cher” two years before was unendurable, and so she was wearing her autumn coat instead, her shoulders tensed by the icy wind. Next to her, Eva Serre coughed, a rough, rattling sound which made Philomene forget her own self pity. The older woman’s coat looked old as well as thin. Was she getting enough food? Had the soldiers quartered in the Serre house displaced her from her room to some drafty attic? Most of the affluent families in town had thus far escaped quartering, a token of solidarity from Mayor Perreau, but when Monsieur Serre had burnt down his cement factory rather than turn it over to the authorities for German war work, he himself had been arrested sent to Germany while their house had been turned into a virtual barracks. The door of the first class carriage opened and the crowd stirred as a porter stepped down carrying two large suitcases. Then a tall woman appeared in the doorway, nodded to the crowd assembled to meet her, turned up the fur-lined collar of her coat against the wind, and stepped down to the platform. The visitor returned the greeting and expressed her thanks in French that was fluent, though slow and strangely accented. Introductions were made, and Verna Hawthorne insisted upon giving a firm handshake to each one, man or woman. Justin had secured the town’s remaining motor car to take Mrs. Hawthorne to the Perreau house. Once it pulled away in a growl of steam and petrol fumes, the rest of the crowd dispersed, some to return home, others who had been invited to the ladies’ tea in honor of the visitor to make fifteen minute journey on foot. “If I’d known how close this place was, and that all of you were walking, I would have got my exercise too!” Mrs. Hawthorne declared once the company was reassembled in the Perreau sitting room. Philomene did not doubt it. The tall visitor was not young. There were lines and folds forming around her eyes and a slight looseness of the skin over her strong cheekbones, yet there was no tiredness or sickness in her at all, and the sense of energy and freshness about her was magnified by the obvious newness of her clothes. The war had come in summer, and since then there had been no new shipments of clothing or materials. Instead of poring over catalogs from Paris, even the town’s best families had sat up nights mending and cleaning last winter’s clothes. Watching the visitor from America served as a reminder of how quickly peace and comfort had come to look alien. Madame Perreau poured tea and coffee, encouraging the ladies to help themselves to the little cakes which were piled on a silver tray. Philomene took one and savored each small bite. The cakes were clearly made with white flour and white sugar. Those, along with the generously poured servings of coffee and tea, were a clear sign of both the Perreaus’ wealth and Justin’s connections with the occupation authorities. “I’m sure this is a poor spread compared to what you are used to in Boston,” Madame Perreau said to their visitor. The women seated around the room exchanged looks. Few enough of them had any tea or coffee at home. The shelves of the Mertens store had been bare of such things for several months. They could only hope that Madame Perreau’s determination to show off her hospitality (and ability to procure scarce supplies) would not keep them for receiving the supplies which rumor had it the Americans where shipping by the boatload to those in need. “All the official meetings and inspections are later, but I believe that this gathering is the most important that I will have here,” Mrs. Hawthorne said, shifting from a conversational tone to one with a touch of authority which brought all other discussions in the room to a halt. She set her cup and saucer to one side and looked around to make sure that she had the attention of all assembled. 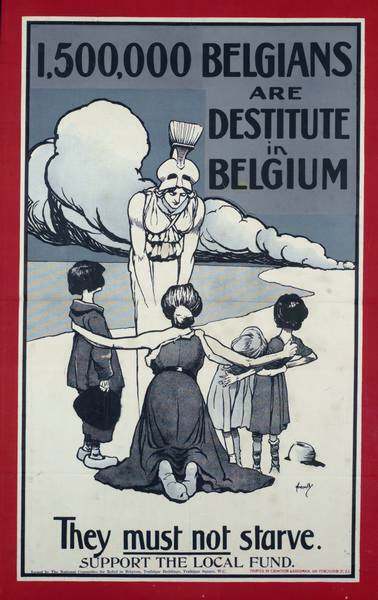 “As you know, our mission at the Committee for Relief in Belgium is to help the ordinary people who are deprived of everyday necessities by this cruel war. My country is neutral, but I think that here among friends I may say what I believe: this is a war of aggression, and we owe those of you suffering under unjust occupation every help that we can provide. The exchange gave Philomene a sudden pang. She was talking to him as she would have to Henri. Before the war, Grandpere would have gone off in the evening to sit in his threadbare old armchair in the sitting room, taken a pipe or cigar from his tobacco cabinet, and sat there reading while she and Henri talked. Where was Henri now? Her father’s somber tone stopped her. “Why not?” She had not, until that moment, thought of seeking the position herself, only of finding some way to deny it to Madame Perreau, but in the moment her father told her she could not do it a vision sprang into her mind of the good that she could do. Why not indeed? After meeting with Mayor Perreau, Madame Hawthorne of the Committee for Relief in Belgium announced the formation of a three member Relief Committee to consist of: Mayor Perreau, Pere Lebas, and Monsieur Thierion. The Relief Committee will be responsible for assessing need in Chateau Ducloux and for distributing any relief supplies sent by the CRB. So, the head of the Masonic Lodge was to be the third committee member. Mrs. Hawthorne must know well enough what she was about. She had the town government and the church already, the lodge drew its members primarily from the secular half of the town’s great cultural divide and politically from the supporters of the Republic. If only Henri were there. Despite having at last begun, after several years of marriage, to go church with her, he had always gone to the coffee house and the bar frequented by the masons and the radicals rather than the conservative establishments her father patronized. He and Monsieur Thierion had not been close, but Henri would have known how to approach him and convince him. Instead, this was yet another reminder that Henri was far away, if he was still alive at all. The thought left her blinking at the paper through eyes that suddenly found it difficult to focus, but she fought back the choking feeling and the tears which seemed to come so unexpectedly these days, and addressed herself instead to the problem at hand. Justin Perreau would support his mother for the administrator post, that was certain. That meant that she would need both Pere Lebas and Monsieur Thierion, but before she could make either of those approaches, there was something she must do first. “This should really be a question for Reverend Mother,” said Sister Genevieve. Philomene looked down at the teacup on the table before her. It was the same fine bone china, with its pink roses and gilded rims. The same dark, rich tea. The same wood paneled visitors parlor. The war’s only incursion into this sanctum of hospitality was that the old sister had not poured herself a cup of tea when she poured one for Philomene, as if it were already lent. Was the convent rationing its tea, or had the sisters decided to offer up such comforts as a sacrifice while they prayed for peace? Philomene got up to leave, eager to set about talking to the committee members, then hesitated. The one thing that was always lurking at the back of her mind, she was almost afraid to ask out loud lest facts crush hopes. “I don’t suppose…” She let the question trail off. Philomene nodded. “I know. It’s just-- Do you know, perhaps it’s wicked of me, but when I pray for him I hear nothing at all in return. I’ve read in books, like the one by Sister Therese of the Child Jesus, about receiving consolations, about feeling God’s love. There have been times, such as on retreat, when I’ve felt such peace when praying. But now…” She shrugged. There did not seem to be words that could be spoken here for the cold, taunting silence which answered her, making her almost afraid to pray. The only thing which kept her from giving it up was the fear which she knew to be very close to superstition: If she did not pray for Henri’s safety every night, and something happened to him, would it be because of her omission? Julien Thierion owned the town’s clock shop, a small storefront in which a dozen clocks and an impressive array of watches were displayed, as well as a few telescopes, binoculars and cameras. A bell hung from the door chimed as Philomene entered. Monsieur Thierion was seated on a tall stool at the workbench, taking a pocket watch to pieces. He set his work aside and rose when he saw that his visitor was a lady. Surely he must often receive callers on business relating to the Lodge, but although it was the reason for his prominence in the town, it was technically a secret. Philomene sat down and smoothed her skirts out to occupy her hands. His slightly mocking manner was much like that of Henri’s closest friend, Andre Goyot, the Postmaster, who was also a prominent member of the Lodge. Was this a characteristic of their set? Or perhaps little edge of humor at her expense because she and her father were known to be associated with the clerical faction. She could see the struggle it took for Monsieur Thierion to keep his revulsion at this suggestion from showing clearly in his expression. “Do you really think that people would find it so offensive for the Sisters to administer the aid?” Philomene asked, trying to load the question with as much innocent surprise as she could. Her host did not seem inclined to see through her motions. Monsieur Thierion saw her out the door with continued expressions of thanks for her help in what now seemed very nearly his own idea, and Philomene set off with a spring in her step towards the rectory to speak to Pere Lebas. In the end, all was done as she had envisioned. Monsieur Thierion and Pere Lebas carried the selection Madame Serre for the administrator position, to the secret relief of Mayor Perreau and the confusion of his mother. In order that she might be near her work, Madame Serre left the house in which she had been surrounded by reminders of her absent husband and the all too present Germans, and took up quarters in the guest room of the convent. From there she went about her work on behalf of the CRB, but even as the need seemed all too desperate, politics and logistics and paperwork drew out, and it was not until May that the first shipments of wheat, rice, beans, and salted pork arrived from the lands of peace and plenty across the sea. I continue to love Philomene! I'm so happy to see Philomene again! Did you mean to write, "This volume covers 1915 to 1916" in the intro? Oh I really loved Philomene's outmaneuvering of Madame Perreau and Monsieur Thierion, it was masterful and made me want to cheer. I liked the foretelling of the new commandant's fate: "There was no hint that his tenure would end under a cloud of accusations that his corruption and incompetence had led to the unnecessary execution of two of the town’s prominent citizens -- accusations of sufficient volume and gravity that the occupation authorities were forced to make a rare gesture to public opinion and move him to another assignment." He's a great character. I already hate him and I dread to see what horrid things he will do in his new kingdom. And oh who is going to be executed? Yes, 1915 and 1916. Fixed. Thanks.